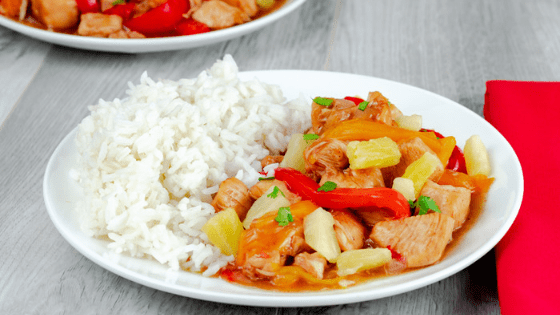 Hawaiian Pineapple Chicken ready in less than 30 minutes is made in the Instant Pot with red and orange peppers, onions, garlic, and with the flavor of ginger. This really flavorful Instant Pot meal is super simple to make because it’s a dump and start meal. After adding the chicken into the pot, adding the juice, soy sauce, vinegar, seasonings, and topping the pot off with sliced peppers and onions – you close the lid and let the Instant Pot do all the work. This meal is perfect for busy nights because it’s ready in less than 30 minutes! During cooking, the chicken releases some additional juices that make this meal look soupy when you take off the lid. No need to fret! Creating a slurry of water and cornstarch and setting the Instant Pot to MANUAL takes care of this problem. The sauce will thicken after sauteing for a minute or two and it will be ready to serve. You can also serve this with a slotted spoon to get rid of any additional liquid if it’s your preference. This meal is made without seasoning packets so there are no thickening agents added in the ingredients as if you were to use bottled sauces or packets. Creating the slurry for the end of the cooking time helps to thicken your meal all while using all natural ingredients! Sweet and flavorful Hawaiian Pineapple Chicken made in the Instant Pot with red and orange peppers. Add bite-sized chicken to Instant Pot. Pour pineapple juice, soy sauce, and rice vinegar around the chicken. Add the minced garlic and ginger. Top with chopped onions and peppers. Close with the lid and close the vent. Allow a NATURAL RELEASE for 10 minutes. Mix the cornstarch and water together to create a slurry. Set Instant Pot to SAUTE and add in the slurry. Add in the slurry and allow to thicken, this will take only a couple of minutes. Mix in the pineapple tidbits and serve.